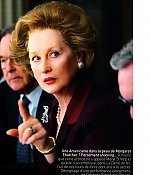 This update has been made possible by fellow visitors Glenn, Séverine, Amélie and Lydie-Caroline who’ve sent in some recent magazine scans of French and Canadian articles. You cann find them all in the image library. Thanks to you all for your generous contributions! 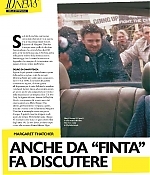 Today’s update features many great scans from around the world, which have been sent to me by Rebecca, Simona and Nat. 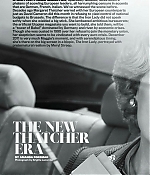 The Women’s Weekly issue is a standout, as it features more stunning pictures from Brigitte Lacombe’s most recent shoot. 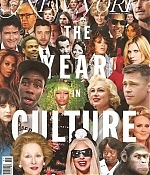 A list of all recent magazine additions can be found below the previews. 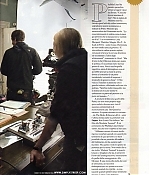 Thank you once again for those fantastic scans! 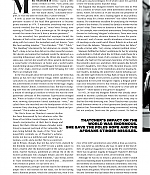 Before these get forgotten as “something from last year”, quality scans from the January 2012 issue of the American Vogue have been added to the image library. Enjoy! This will be the last update for this year (with the exception of the “Year in Review 2011”, coming next week) and I’ve made sure you’ll have plenty to watch, read and listen to for the Holidays. 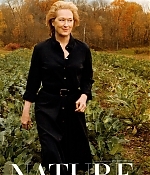 First, Meryl’s appearance on “The View” can be watched in the video archive. 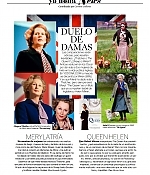 She attended the show yesterday alongside director Phyllida Lloyd, dishing on “The Iron Lady”, her early years at Dartmouth college and visiting the White House for the Kennedy Center Honors. Additionally to the video, HD captures have been added to the gallery. 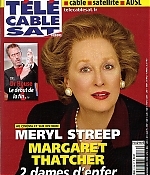 Then, new magazine scans have been added to the gallery, with many thanks to Alvaro. 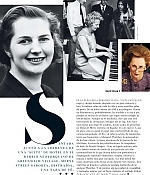 Transcripts can be found in the magazines archive as well, including articles from Sunday Times Culture, The Inquirer, MacLeans’, USA Today, The Los Angeles Times and The New York Times. A list of all new scans can be found below the previews. Finally, I would like to wish all visitors of Simply Streep a Merry Christmas and some wonderful Holidays with your family, friends and beloved ones. 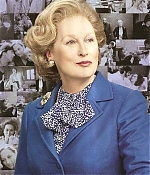 It’s been a great year to keep Simply Streep updated and I’m looking forward to all the news and things to happen in 2012. Have a great time and take care everybody! Frederik. A batch of new magazine scans have been added to the gallery. 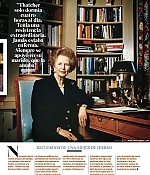 First, scans from the most recent cover stories in Newsweek and the Spanish XL Semanal (as previously reported). 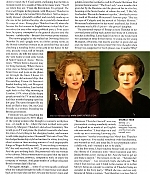 Then, with thanks to Elmira, scans from the December issue of the Italian TU Style Magazine as well as from the July 2011 issue of Story Magazine (looks like a Russian version of Biography). 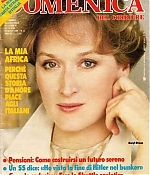 And with thanks to Simona a 1986 article from the Italian La Domenica Magazine, covering the release of “Out of Africa”. 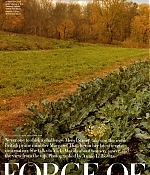 Thanks everybody for contributing, enjoy reading! 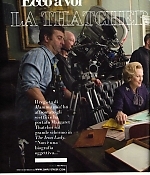 Article courtesy USA Today: There’s a cellphone ringing in the swanky Waldorf-Astoria suite where Meryl Streep is sitting on the sofa, sipping coffee. She gropes through her oversized bag, finds her iPhone and checks its screen in passing. “Agent! Maybe I have a job,” she chortles. 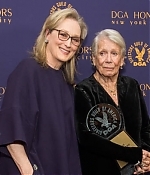 So many superlatives have been heaped upon Streep that it’s tough to separate the living legend from the flesh-and-blood woman with the lightly mussed hair jonesing for some caffeine. 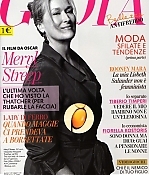 There’s a sparkle to Streep, 62, an innate warmth and a goofy sense of humor. 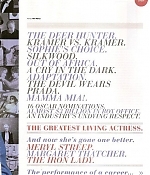 She wears the mantle of world’s greatest living actress lightly, apologizing when her dress gets askew and flashes a bit of skin, and admiring photos of your child before sighing that “it all goes so fast, so fast.” And, she’s quick to point out, there’s not a bounty of juicy roles for even her out there. “There aren’t that many movies around, available. There aren’t that many movies written that I could do. Sometimes they’ll take a villain’s part and turn it into a woman. There aren’t a lot of parts. There aren’t a lot of serious movies,” she says. “That’s all right. I like comedies, too.” But once in a great while comes a part so multidimensional, so delicious, so revelatory as to be irresistible. 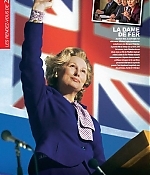 Such was the case with The Iron Lady, which stars Streep as Margaret Thatcher, the polarizing, controversial British prime minister who served from 1979 to 1990. Read the complete article at USA Today. 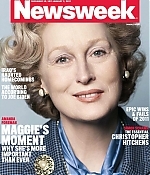 Meryl Streep is a dead ringer for former British Prime Minister Margaret Thatcher on the cover of the new issue of Newsweek, out this week, as Entertainment Tonight has the first look. 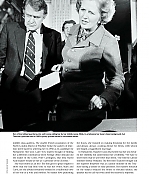 The new issue of the magazine delves into the British political powerhouse’s rise through the ranks. 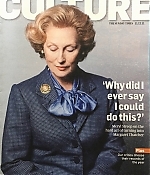 Streep plays Thatcher in the new biopic The Iron Lady, and the Oscar winner tells Newsweek, “While we were making the film, people had such strong and particular and specific venom for her. It was sort of stunning”. 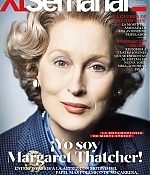 Edit: A similar cover is used for the Spanish XL Semanal magazine (read article), with thanks to Alvaro for the heads-up. 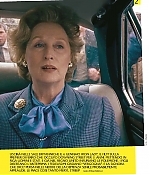 Excerpt and stunning outtakes from Vogue magazine: Never one to shirk a challenge, Meryl Streep takes on the iconic British prime minister Margaret Thatcher in her latest screen incarnation. 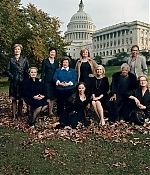 She talks to Vicki Woods about women, power, and the view from the top. 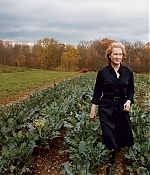 “Oooh, they have oysters,” says Meryl Streep, perusing the menu with intent. “Would you like to get some oysters? Wouldn’t oysters be great to eat right now?” It’s 4:20 in the afternoon. We are the only people in the restaurant on the mezzanine at Union Station, Washington, D.C. 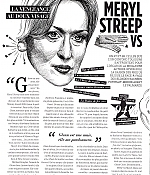 I pass, but Streep says, “I think I’ll have some oysters. And a glass of Chardonnay.” The waitress, who is fizzing with efficiency and controlled celebrity-awareness, makes to whisk off, but Streep calls her back on a sudden thought: “Do you have fresh oysters?” Her face has the look of a woman who has spent the day Being Meryl Streep in order to publicize her upcoming movie, The Iron Lady, and now is yearning to slurp down oyster after leisurely oyster, raw and briny on the half-shell, mmm, maybe with lemon, maybe not. The waitress says firmly that all of their oysters are fresh. 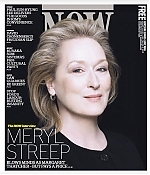 Streep says, “I know. But. Um…. Don’t worry about it.” And with a tiny sigh, she awaits them fried in bread crumbs. 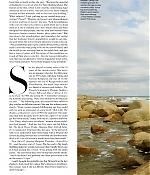 The complete article can be read on Vogue’s website and in the magazines archive.